To Bacon, Pan’s hunt was a metaphor describing the experimental methodology that he called “learned experience.” As a scientific method, Pan’s hunt proceeds from one experiment to another in the same way a hunter tracks his prey by reading footprints and signs. Bacon called this method “a sagacity and a kind of hunting by scent, rather than a science.” The experimental scientist is a hunter of the secrets of nature whose “sagacity” and vast experience enables him to see things others cannot see. Instead of “groping in the dark,” he patiently reads the minute signs and clues that will lead him to his prey hiding in the dense thicket of experience. The metaphor of science as a hunt occurs repeatedly in the scientific literature of the early modern period. In the 1520’s, the Neapolitan astrologer Giovanni Abioso urged natural philosophers to turn away from the books of antiquity and “hunt for new secrets of nature.” Giambattista Della Porta, another Neapolitan, used an image of the lynx—the keen-sighted predator—as the emblem for his book on natural magic, thus inspiring the name of the Accademia dei Lincei, one of the earliest scientific academies. Another academy, the short-lived Accademia Cacciatore (Academy of Hunters) founded at Venice in 1596, adopted as its device the symbol of a dog pursuing a hare. 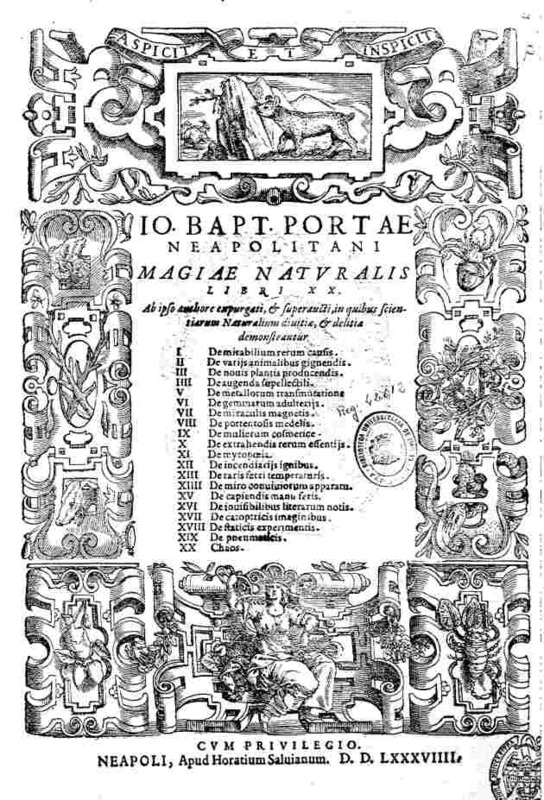 Title page of Giambattista Della Porta’s Magia naturalis (Natural Magic, 1589), with the emblem of the lynx and the motto, "aspicit et inspicit" (look out and look in). 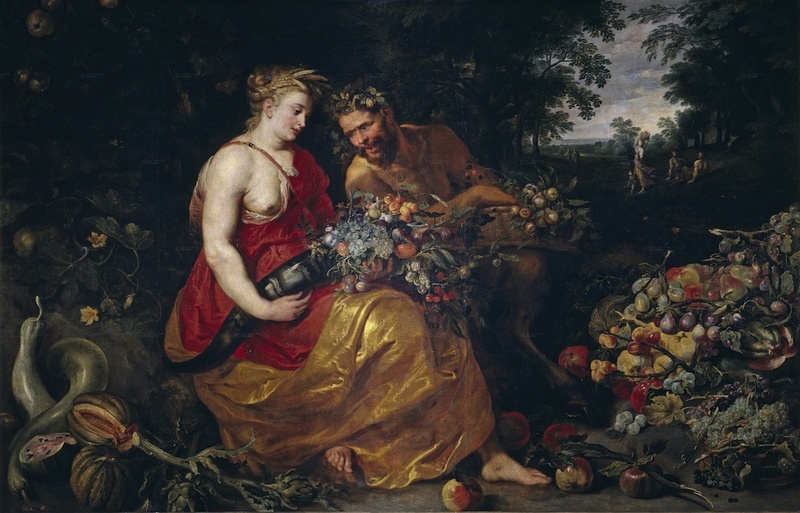 The advent of the hunt metaphor in the scientific discourse of the early modern period testifies to the emergence of a new conception of the aims and methods of science. Instead of viewing natural philosophy as a sort of hermeneutics, or textual analysis—“natural philosophy without nature,” as the late John Murdoch aptly characterized late-medieval physics—intellectuals of the early modern period tended to think of science as a search for new and unknown facts, or of causes concealed beneath nature’s outer appearances. To these contrasting images of science—one as logical demonstration and the other as a hunt—corresponded radically different images of nature. One conceived of nature as a geometrical cosmos, a reality whose essential features could be known by reason. The other viewed nature as a dense forest, an uncharted domain, a labyrinth in which method offered but a thin thread to orient oneself. The repeated references to the hunt for the “secrets of nature” in the scientific literature of the seventeenth century should not be dismissed as mere rhetoric. Far from being a mere hackneyed metaphor, the continual appearance of that well-worn phrase indicates a subtle shift in the direction of natural philosophy. The concept of nature’s “secrets”—that is, the idea that the mechanisms of nature were hidden beneath the exterior appearances of things—was the foundation of the so-called “New Philosophy’s” insistence upon getting to the bottom of things through experimentation. The scholastics had been too trusting of their senses, the New Philosophers asserted. Their naive empiricism was responsible for the erroneous belief that nature exhibits her true character on the outside. In reality, the New Philosophers declared, nature’s workings are hidden. The unaided senses do not reveal reliable information about what makes nature tick any more than observing the hands of a clock reveals the clock’s inner mechanism. The New Philosophy redrew the boundaries of science: It brought the secrets of nature back into the picture. When the aim of science shifted from demonstrations of the known and familiar aspects of nature to a hunt for unknown “secrets of nature,” modern science was born. Lorraine Daston, “The Factual Sensibility,” Isis 79 (1988), 452-67. Paolo Rossi, Philosophy, Technology and the Arts in the Early Modern Era, trans. S. Attanasio (New York, 1970). Very interesting article – thank you! I like the idea of discovering nature through the hunt, and the powers of observation. Interesting. It seems that Bacon may have some sympathy with “theory ladenness of observation” doctrine as espoused by Hanson, Kuhn, etc. The metaphor of the hunter is instructive. The experienced hunter, and a city-boy like myself, may have the same image on our retinas when looking at a piece of the forest. I will just see another bit of the forest, the experienced hunter will see the prey’s trail. The simple point that observing is a skill, one that can be improved with practice and training, seems to be forgotten regularly in the history of philosophizing about science, e.g. the logical positivists might have taken a few notes from Bacon. I am happy to read this article. using the historical approach author shows us the importance of philosophizing about science. I have more than 14 years experience in researc but I know that I know nothing, i.e. I am hunting for science, particularly figurative language in the focus of contrastive linguistic.